It’s always a pleasure working with Land O’Lakes to bring you my newest recipe. This one deserves a standing ovation. This pizza has got all of my favorite ingredients that makes the house smell like a dream. Roasted Brussels Sprouts and crispy bacon lay on top of my homemade creamy Parmesan Rosemary sauce. You don’t want to miss this one! I am so excited about the Land O’Lakes called Pin a Meal, Give a Meal Campaign. This program is amazing, for every Land O’Lakes recipe that is pinned or re-pinned between March 28 and May 1st, 2014, the Land O’Lakes Foundation will donate $1 to Feeding America. Be sure to help us reach our goal to donate 2.7 million meals. 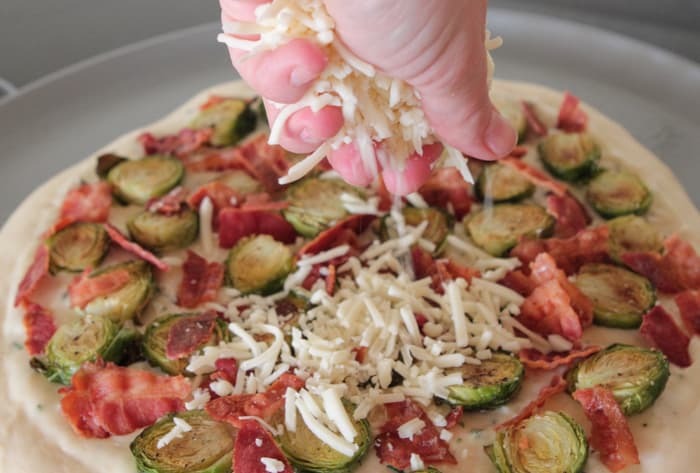 You can pin my signature recipe, Parmesan Rosemary Brussels Sprouts and Bacon Pizza to contribute 9 meals to Feeding America. You can pin more recipes from Land O’Lakes to contribute even more meals. Pin to give more than just a meal. When you help feed a family, you’re helping families live full and active lives and make a better future for themselves. See the Pin a Meal, Give a Meal Pinterest Board HERE. Let’s take a look at how to make my pizza! 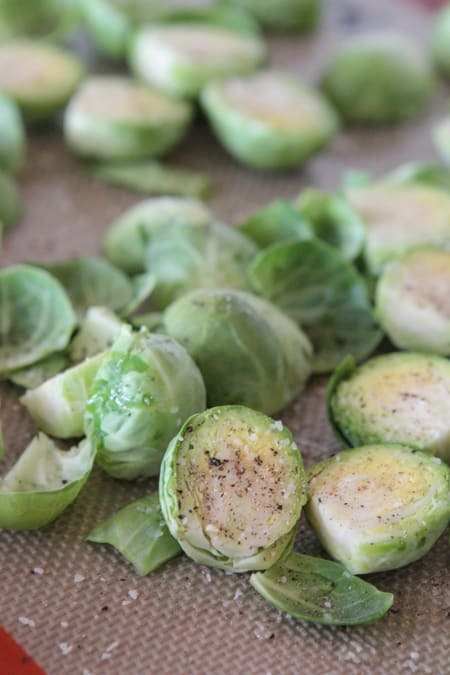 You’ll start by halving your brussels sprouts, drizzling with olive oil and seasoning with salt and pepper. Bake until roasted and beautiful! Perfect! Set those aside for a few minutes while you make the sauce. For the sauce you’ll need Land O’Lakes Spreadable Butter with Canola Oil, flour, salt, pepper, milk and Parmesan cheese. 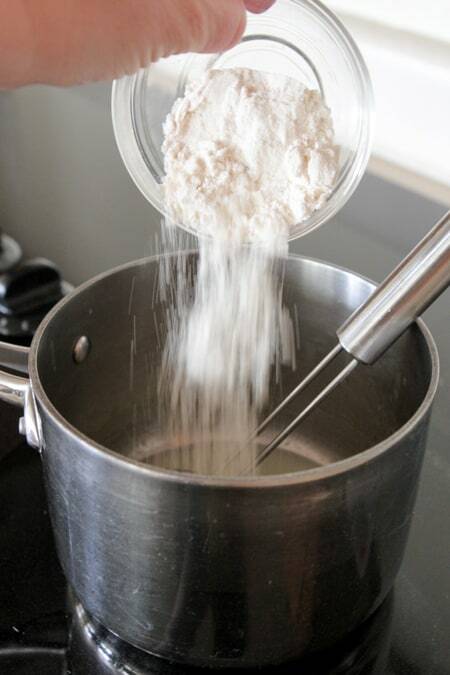 Melt your butter into a small saucepan then whisk in the flour, salt and pepper. 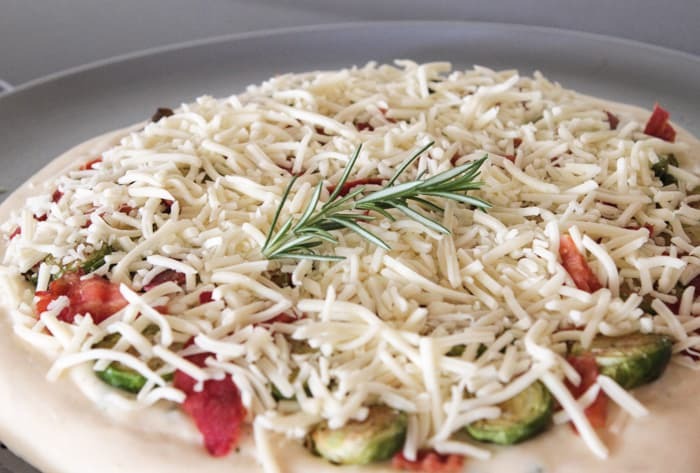 Whisk in your milk, Parmesan cheese and chopped rosemary leaves. 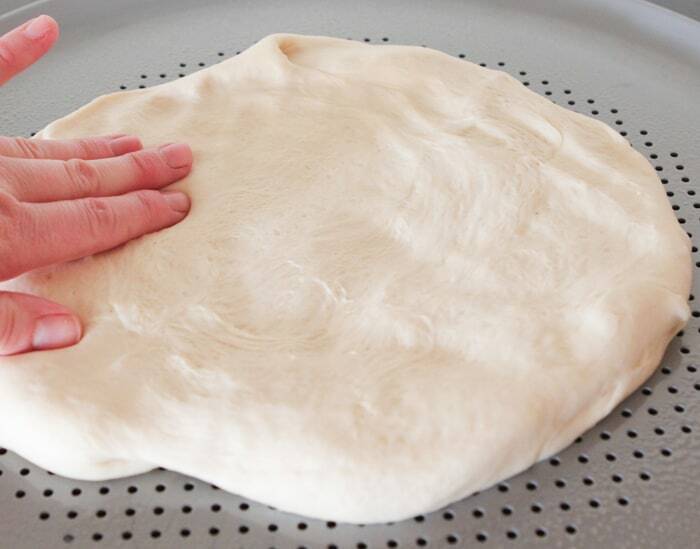 Press your pizza dough onto a pizza pan that’s been sprayed with cooking spray. Spread your creamy sauce over the dough. Top evenly with your roasted brussels sprouts. Top with a sprig of fresh Rosemary if desired before baking. Bake for about 20 minutes, or until baked through. 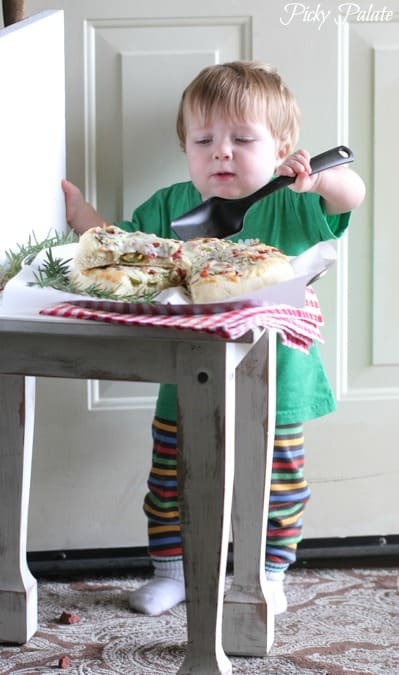 Pax was eager for the photo shoot to be over so he could dig in, lol! 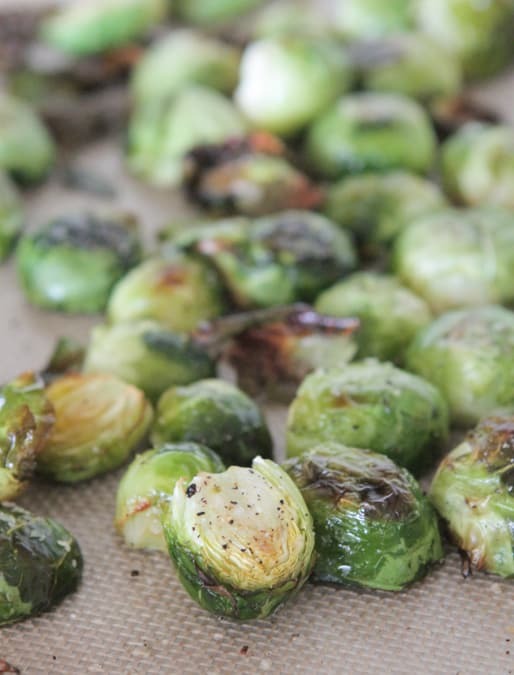 Place brussels sprouts onto prepared baking sheet and drizzle lightly with olive oil then season with salt and pepper. Cook for 25 minutes, until golden brown and tender. Remove from oven. 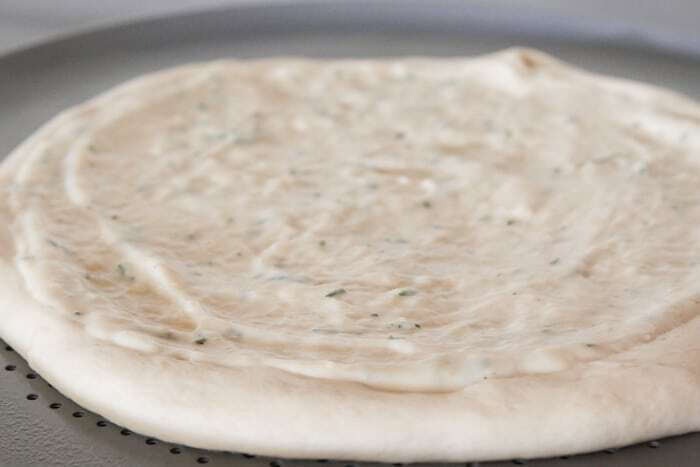 Press pizza dough onto a pizza pan lightly sprayed with cooking spray. Press into about a 12 inch round. 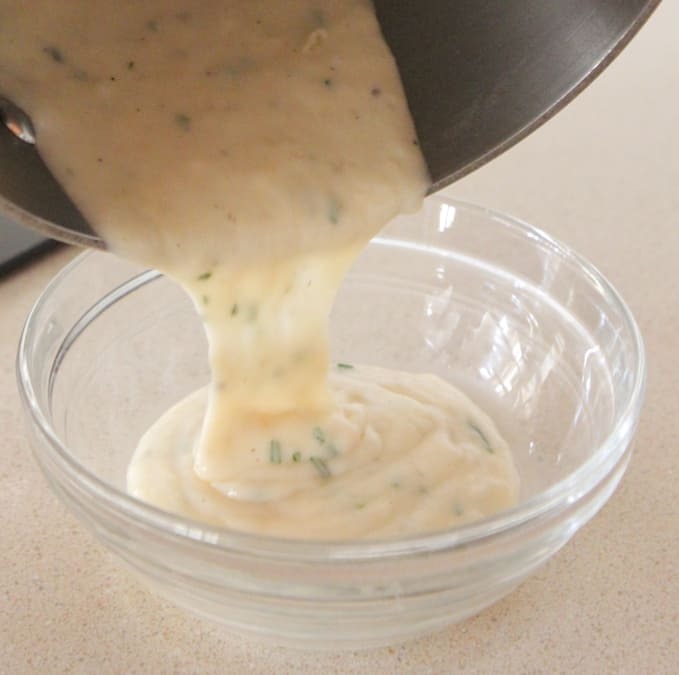 To prepare sauce, place butter into a small saucepan over medium heat. When melted whisk in flour, salt and pepper. Whisk in milk until thickened and hot. Whisk in Parmesan cheese, stirring until melted. Stir in rosemary leaves then pour onto pizza dough, spreading to 1/2 inch from edges. Place roasted brussels sprouts evenly over sauce then top with cooked bacon pieces. Top with shredded cheese and bake for about 20 minutes, until crust is cooked through and cheese is melted. Let cool for 5 minutes before cutting into slices. 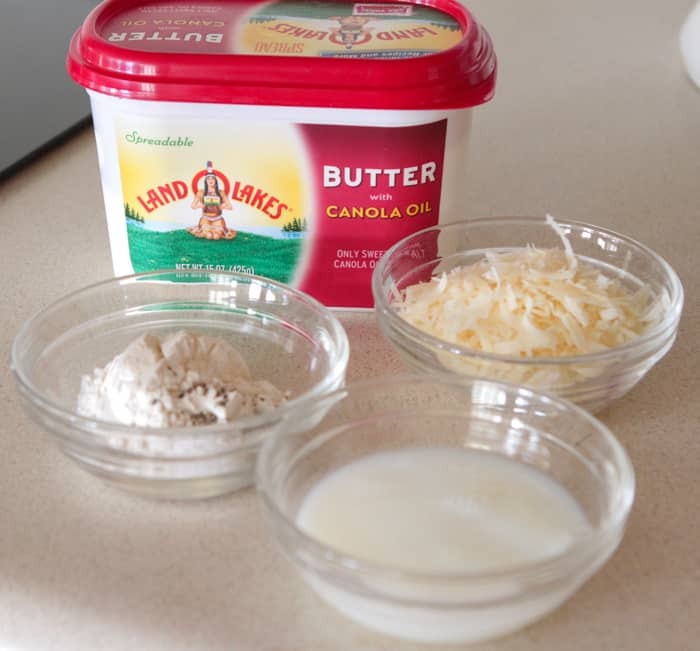 Land O Lakes® Butter for the Kitchen Conversation blogger program. This blog post is sponsored by Land O’Lakes. That picture of Pax is way too cute! Food blogger in the making 🙂 PS totally craving pizza for dinner now!! The pizza looks perfect! I love rosemary! 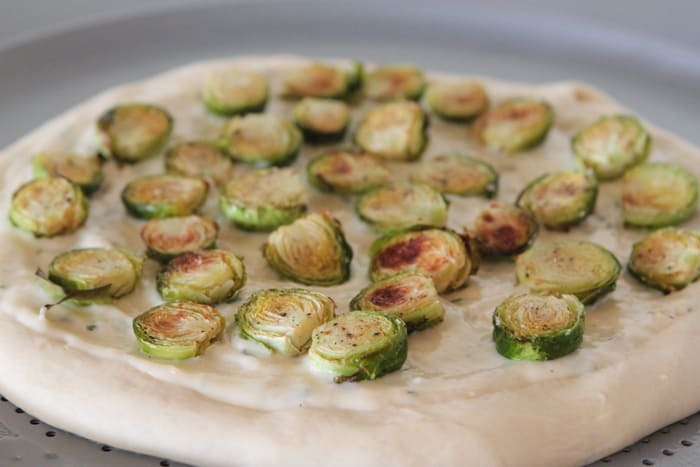 LOVE brussels sprouts on our pizza! The creamy sauce is a great idea. Jenny, this pizza looks SO good! Roasted Brussels Sprouts? Bacon? Butter? Sign me up! And PAX!!! He’s *such* a cutie pie! OMG! Love this pizza! And the pic, Pax, my heart melted. So cute! Roasted brussel sprouts are definitely the best. This looks look a swell pizza. Have a beautiful Monday Jenny! 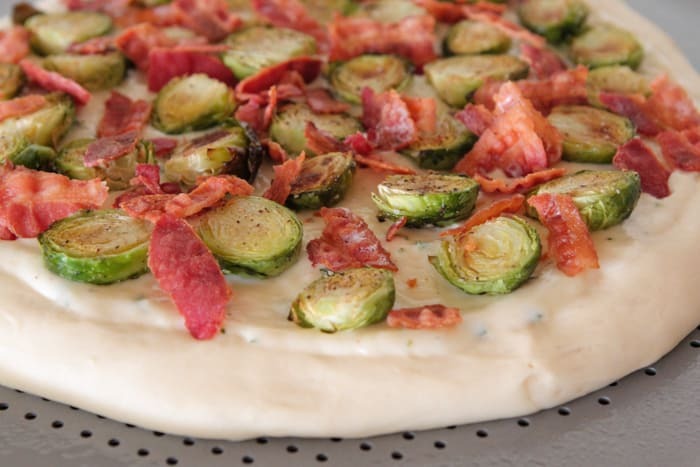 Brussels sprouts and bacon on a pizza? SOLD. I could use a slice (or 2) of this pizza. YUMMMM! I love this idea of pinning for Feeding America! 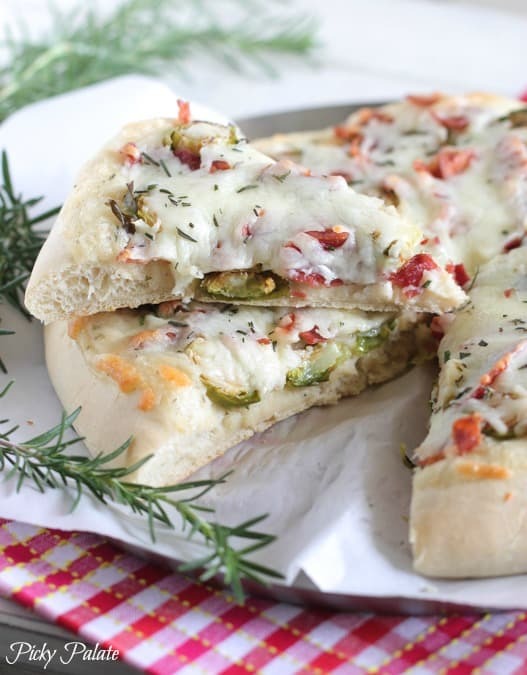 I am pinning away because it’s for a good cause and this pizza looks soooo good! What a great campaign to be a part of! This looks great. I can’t wait to try it. 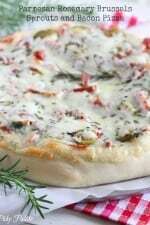 I adore rosemary on pizza. 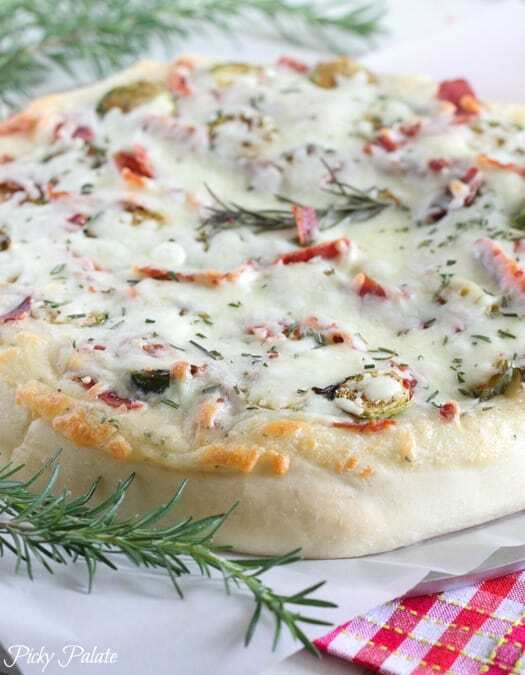 Love this beauty with the creamy parmesan sauce! What a great pizza! I can’t wait to try it! Wow I love this campaign! What an awesome thing Land O Lakes is doing! And thanks for working with them on it! Also, this pizza – perfection! I need to try it asap! Gorgeous photos, and I love all the step-by-step pics. This pizza sounds so good, I love brussels!! Pinned, pinned and pinned! 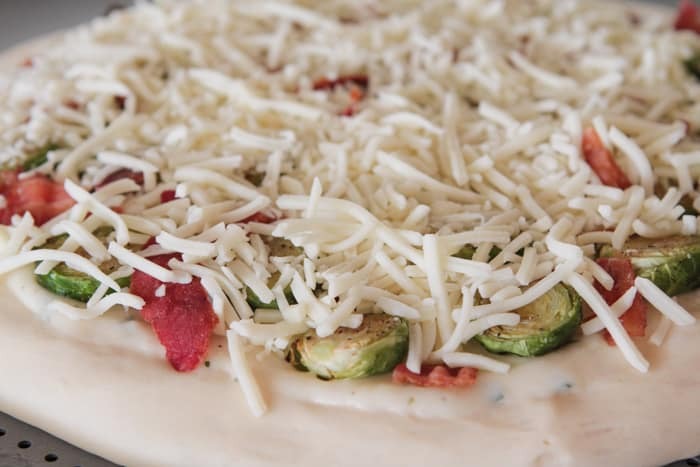 I have never used Brussels sprouts on pizza but I am willing to give it a try. And that buttery sauce sounds so good. What could be wrong with butter, brussel sprouts, bacon and cheese. Seriously, I will make this pizza. Love this so much…it’s beautiful! Haha that photo of Pax is the cutest thing! I was planning to make pizza tonight and I have ALLLLLL the ingredients to make this. Can’t wait to try it tonight! I know it’s going to be awesome. I need this right now. I have a love affair with Brussels Sprouts…and bacon for that matter. Can’t wait to try it out! Wooohhh! This pizza looks so, so good! And I love that photo of Pax–too cute. OMG. Pax is adorable wanting that pizza and all that CHEESE are you kidding. That was a run on sentence. Thanks beautiful Bev!!! I want to snuggle those sweet babies of yours!! making this for supper tonight. Is the 1/4 cup of milk right? I had to add another 1/4 to make the sauce otherwise it was just a clump of paste. Can’t wait to bite into it! Yum!